Abstract: The U.S. Insurance market is large and growing. Insurers are diversifying rapidly into non-core fixed income mandates. Doors are opening for investment managers heretofore unable to tap this growing market. In the face of increasingly complex and volatile capital markets, insurance companies are turning to external managers to access better investment resources, specialized strategies and expertise. U.S. insurers’ general account assets totaled over $5.6 trillion at year end 2012, with an estimated $950 billion (17% of total GA assets) outsourced to unaffiliated third party investment managers. From year end 2008 through 2012, outsourced assets grew at 11.9% annually. Our recent survey (Insurance Asset Outsourcing Exchange, November 2012) finds that 45% of large U.S. insurance companies will increase use of external managers over the next two years. New insurance mandates (from US-domiciled insurers) reported to EDH’s Insurance Asset Outsourcing Exchange are up 20% in the first two quarters of 2013 relative to the prior year. Insurance companies often find that in-house investment staff lack expertise needed for exposure to diversifying or yield-enhancing satellite investments they need. 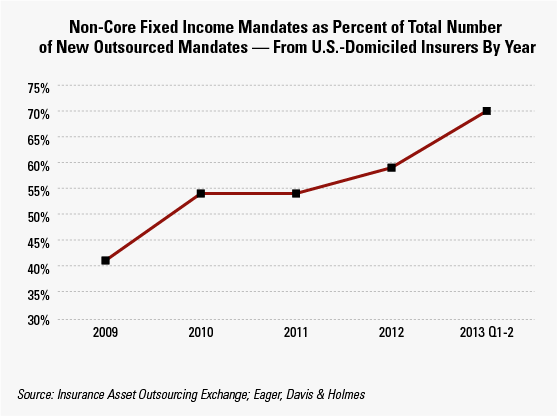 In the first half of 2013 over two-thirds of all mandates outsourced from U.S.-domiciled insurers went to non-core mandates; including specialized fixed income (such as high yield, emerging market debt, bank loans and corporate debt), alternative investments and equity roles. Doors are Opening for Investment Managers Heretofore Unable to Tap this Growing Market. Advances in risk management and accounting system technology are reducing barriers presented by multiple manager platforms and non-core fixed income investments. Systems such as Clearwater Analytics that view all company holdings on a single platform in some respects level the playing field between insurance-focused asset managers and less resourced managers. Insurance regulations are evolving to meet the investment needs of insurance companies. For example, the NAIC has assigned a favorable RBC charge to many ETF’s that reflect their underlying assets rather than the equity charge previously assigned. (Note: Barriers to ETF’s remain at the state regulatory level.) Likewise, EDH believes innovative investment vehicles are on the horizon that could mitigate the complexities associated with holding alternative investments. Question: How should our firm respond? The insurance market will not be hospitable to every investment manager. You must approach this market with a keen understanding of insurers’ investment needs, a knowledgeable sales staff and importantly, the investment solutions that insurers seek. What is the demand/supply environment in the insurance market and how does our firm stack up? What segments of the insurance market should we target? What product, resource or service enhancements are needed for us to succeed? How can we utilize new and evolving product structures that make non-core strategies more appealing to insurance company investors? What is our firm’s most compelling value proposition for the insurance market? What actions can our firm take to build awareness and momentum in the insurance market? Is our sales staff prepared to pursue the insurance market?